This entry was posted on August 27, 2018 by chris elliott. Dark coloured bamboo flooring can look exotic and charming in any style of home. It can look amazing as a statement flooring in an entrance hall or living space. Team it up with light furnishings and décor to really make your dark bamboo stand out. There are different choices when it comes to dark bamboo flooring, depending upon how dark you want it to look. Carbonised bamboo flooring is a light coffee colour, whereas Chestnut bamboo is even darker. Furthermore you could opt for a rustic brown with black stains or even stone grey colour. To make sure that you get exactly the right colour we would recommend ordering your free samples. This will give you the chance to look at the different colour options in your own home. How is dark bamboo flooring made? Firstly, carbonised bamboo flooring is a process where the raw bamboo is smoked to give it a rich coffee colour. The strips or strands of bamboo are dried and then smoked, or carbonised to change their colour. The planks of flooring are then made. This means that your bamboo floor is the same colour all the way through as all of the bamboo has been carbonised. Secondly, the bamboo flooring is made using the natural (golden) bamboo and then a colour stain is added. The planks of bamboo flooring are made as usual. Before they are protected by lacquer, a dark colour stain is added. If you choose the rustic bamboo flooring, the black streaks are added at this stage. The surface of the flooring then protected with lacquer before it is finally finished. For more information, have a look at: How are the different bamboo flooring colours created? 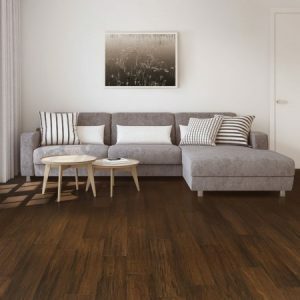 Why choose dark bamboo flooring? Large spaces with lots of natural light.